In practice since 1991, Matthew Golden concentrates in worker's compensation and social security disability law. Matthew is the former guardian ad litem for Lycoming County where he represented children in dependency cases. Matthew has also served on the Governance Committee of West Branch School, a non-profit school offering K-6 education in the Williamsport area. Matthew is a member of the Pennsylvania Bar Association and the Lycoming Law Association and is accredited by the Better Business Bureau. 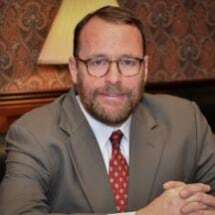 Matthew is licensed to practice law in Pennsylvania and has over 25 years of experience.